Chapters Three and Four of Dave Jacke and Eric Toensmeier’s Edible Forest Gardens Volume Two (2005) contain what is likely the permaculture literature’s most systematic and comprehensive presentation of sound design process. Interestingly, the design process described therein (which Jacke prefers to call ecological rather than permaculture design process) almost completely avoids permaculture’s dominant view of design as a process of element assembly. Not only is the presentation light on talk of element-assembly, it is remarkably consistent with Christopher Alexander’s differentiation-based approach to design. These statements contrast with the quotations previously shared from Bill Mollison’s The Permaculture Designer’s Manual (1988), Jessi Bloom and Dave Boehnlein’s Practical Permaculture (2015) and Toby Hemenway’s The Permaculture City (2015). There any talk about design process is dominated by a diversity of ways of saying that design is a process of starting with elements then assembling them into wholes. Interestingly, Jacke doesn’t talk explicitly about design as a process of sequential differentiation as does Alexander. Nonetheless, his approach is fully consistent with this viewpoint. Jacke is consciously moving from wholes-to-parts, from patterns to details. 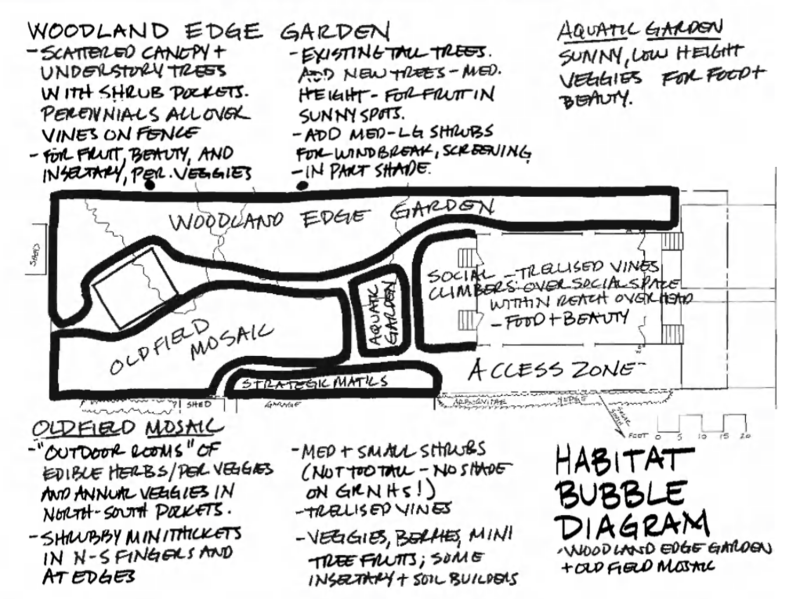 These diagrams are adapted from Edible Forest Gardens, Volume II by Dave Jacke with Eric Toensmeier (October 2005) and are reprinted with permission from Chelsea Green Publishing. These diagrams exemplify design when practiced as a process of successively more detailed differentiation. Of starting with wholes and working toward parts. There is no feeling of bringing in and connecting together elements. There is a feeling of the progressive unfolding or discovery of the design. Dave Jacke has contributed the most comprehensive, conscious and clear treatment of sound design process yet seen in the permaculture literature. His ecological design process moves primarily from patterns towards details via the sequential differentiation of wholes into parts. This resonates with and indeed was to some degree inspired by the writings of Christopher Alexander (among other influences – see the postscript below). In a recent conversation, David Holmgren emphasised the importance of creating design processes that respect and mimic the way in which nature works from patterns to details. To date (as previously discussed) most writing about permaculture design has been hindered by the culturally dominant, problematic, and self-contradictory belief that conscious design starts with details (or parts) and works toward patterns (or wholes). A notable exception, Dave Jacke’s work deserves respect and attention as an example of a genuinely ecological design process, and almost certainly the deepest application of Christopher Alexander’s ideas within the permaculture literature to date. I have to say, though, that upon reading the latest post I wonder how much I actually do inhabit the paradigm of Alexander. I have bought into the typical PC design paradigm significantly, too. I don’t think I am immune to that perspective. I actually think I combine both. Not sure what I think about that—is that an advantage or not? When I design polycultures I most often use the “guild build” process where I am literally assembling plants that may never have grown together before and trying to create functional wholes. 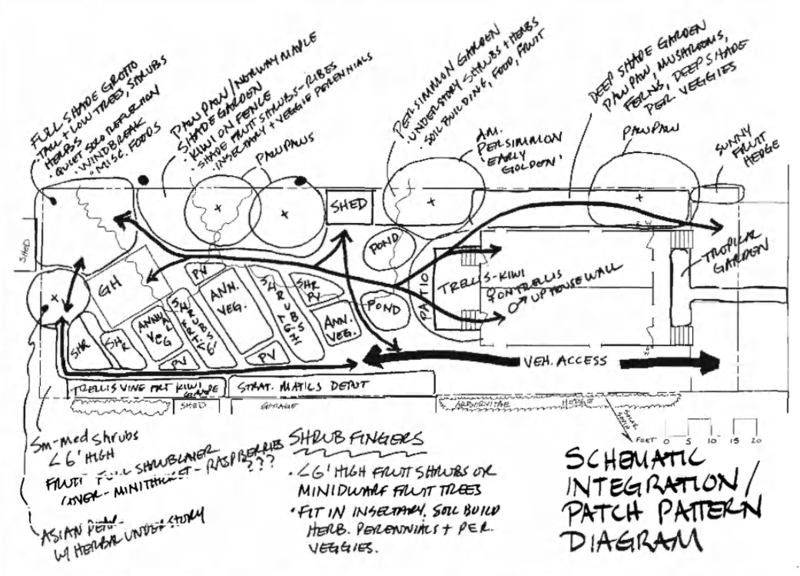 … However, the architectural design process of identifying a habitat bubble and differentiating it into patches and then articulating that into patch designs is very clearly aligned with Alexander’s approach. And goals articulation is itself a process of acknowledging and attempting to articulate and differentiate the structure of the clients as a whole, in a way, as is site A&A. I think of the design phase as relating those two streams (client and site) to see what patterns emerge from the relationship, which feels aligned with Alexander’s approach also. So it’s all an interesting reflection process to hear how you see it and how I fit into it. You are convincing me that I am more embedded in Alexander’s perspective than I thought I was! 🙂 Interesting to have me quoted back at myself and have that effect my self-understanding! But I would say that Alexander influenced this reality within myself, as did Walt Cudnohufsky and Don Walker at the Conway School of Landscape Design, AND, perhaps most importantly, my own inner body mind drive/yearning for a sense of wholeness in myself and the world, which is what led me to engage with permaculture in the first place. And also has led me to step away from permaculture per se, by that name, a number of times in my career, because I have gotten fed up with the old paradigm that still runs through much of the movement and culture and practice and literature of permaculture. In any case, writing EFG was part of my long struggle to integrate what I valued from Alexander’s work, with the approach of Ian McHarg (which was my initial introduction to conscious ecological design via Design With Nature), with what I learned at CSLD, and with what felt native to my own inner design process. In fact, since EFG has been published and I have been teaching all over the place the last 11 years, I have even more fully integrated all of this and can now see many implications of conscious ecological design process for the growth and development of human beings generally and myself in particular, and how the deep fundaments of conscious ecological design processes connect directly to solving what I see as the fundamental problems underlying the current cultural crises we face as a species. More on that sometime. It goes far and deep and wide, though, I’ll tell you what, and I know I have only begun to plumb the depths and reaches of this interrelationship… I think that starting [the] quest for improving permaculture in the realm of design process is a brilliant place to start, because so much flows from that. So much. I just should add that a key influence was also Marty Naumann, my undergraduate professor of ecology at Simons Rock Early College. He was a follower of Odum–we used Odom’s textbook in my ecology classes. Marty taught systems ecology he did not teach reductionist ecology. He too had an intuitive grasp of holism. He and I resonated very well together. I didn’t learn ecological design from him but I learned ecology from him and it rose up in me as I was reading your posts back-and-forth with Mr. Holmgren that I need to include him as one of my significant influences in developing my design process. Alexander, C. (1964). Notes on the Synthesis of Form. Harvard. Alexander, C., Ishikawa, S., Silverstein, M., Jacobson, M., Fiksdahl-King, I., & Angel, S. (1977). A Pattern Language. Oxford University Press. Bloom, J., & Boehnlein, D. (2015). Practical Permaculture. Timberpress. Hemenway, T. (2015). The Permaculture City. Chelsea Green. Jacke, D., & Toensmeier, E. (2005). Edible Forest Gardens V2 (Vol. 2). Chelsea Green. Mollison, B. (1988). 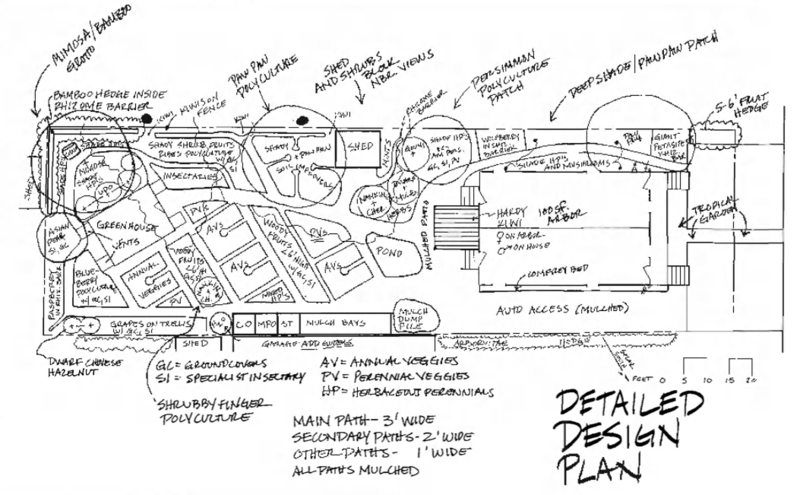 Permaculture: A Designer’s Manual. Tagari. I studied permaculture from Toby Hemenway, and he used EFG as his textbook. It had just gotten published the previous year, I think (2006?). I think we are seeing an emergent focus on design process — something that Mollison himself saw lacking in the current permaculture framework. We see Darren Doherty picking up that mantle (hooray!). EFG was my first introduction to the SOP, and it immediately clicked as waaaay more important than anyone had previously written in framing the structure and process of ecological and pattern fluency for observation and design. I think the Regrarian synthesis and update of KSOP with Holistic Management hits the spot on the need for sound process framework guiding observation and design, and integration of humans into the whole (and practical things that permaculture so often ignores, like our motivations and available resources, etc). I also think the pattern language has a conceptual design and pedagogical tool remains underdeveloped and underutilized. I wrote up an essay on this topic for a Keyline compilation I’m assembling for my own studies in anticipation of the Regrarians Platform and my own holistic planning process, happy to share any of it. Anyway, as soon as I learned about the Regrarians Platform, I breathed a sigh of relief and crossed it off my “someone’s gotta do this and it might as well be me” list of projects. It might as well be Darren, with all his various capacities, experience and embodiment of important ethical principles (how many others have openly talked about and integrated their relationship struggles and goals into their ecological design mission?). Hooray! I’m also working on what I believe is a spiritual successor Toby’s recent focus on “Liberation Permaculture.” Right now the working title is “an ecology of liberatory struggle.” It touches on a few points that David Jacke mentions here about the cultural crisis so many of us feel, and addresses the context and trajectory of the emergence and evolution of the human species. Thanks for pushing on the innovation and synthesis! To you, David Jacke/Eric Toensmeier, Toby, Darren, Mark Shepard, everyone who continues to push. I also appreciate Geoff Lawton’s reminder that we’ve also only begun to scratch the surface of Permaculture: *A* Designer’s Manual, and it is far from obsolete, but also far from accessible for many of us. Only now do I feel like I have the framework to organize and make sense of it. With these innovations and an improvement in my own thinking and capacities, I feel a newfound appreciation for such classic (and increasingly-relevant) works. ps. Yeah I was touched the first time I read Darren’s holistic context and saw the stipulation that if you wanted to fly him somewhere for more than a week, then you’d need to factor in tickets for his whole family. a) Where do breakthroughs come from / How are new responses to patterns conceived? This could be where design by assembly can be an effective way to come up with new responses to patterns – see to Dave’s comment about “guild build”. b) How do we, as designers, observe and respond to changes to patterns at a given site or climate? Without maintenance, it could be that people start designing such that Pattern A always leads to Design Element A, which is no better than details to patterns! Wow, interesting, I never realised that permaculturists thought of design as simply an assembly of elements, so I’m in shock. Much of what you’ve put forward here resonates with what I’ve always taught and practiced as design process, “From Patterns to Details”. First get the big picture patterns in context – starting from bioregion and neighbourhood (geo-physical & social patterns, I’ve developed my own ESM tool for this), and clarify the strategic plan (vision, aims, objective, values). Then the patterning more immediate external influences (sector analysis) and mapping the patterns within the site itself (site analysis). Here I find Ian McHarg’s exclusion overlay process particularly useful as a tool for mapping the ‘higher order’ ecological needs of the site (I call this “listening to the land”) plus other restraints (buffer zones, legislative, planning), which then provides a context to move into conceptual bubble planning, functional analysis, flow patterns & analysis, which lead into spacial patterns and relationship between systems (zonation), then last, but not least the placement and patterning of the individual elements as the design details. Assembling or patterning the relationship of the elements always come last and within the context of the big-picture patterns. Thanks for dropping by Robyn and sorry for the shock ;-). That’s a lovely concise description of your authentically holistic patterns-to-details design process and I have long respected your leadership in terms of injecting a degree of substance into permaculture design process that can otherwise be lacking. Won’t you please write a book about this? At the least at some point I’d love to talk with you about developing a more detailed outline of your approach, along with a case study of at least one of your projects (I’d love part of this project to become profiling the design processes of permaculture’s most experienced designers for others to compare, share, and learn from). Or at the least interview you for a podcast about how your design process has evolved over time and where is at now. Anyways all in good time and cheers and thanks for everything you’ve done and are doing in this space. Because of these posts I came to revisit C. Alexander and that led me to The Battle for the Life and Beauty of the Earth which I’ve been enjoying. Now I know almost nothing regarding permaculture, farming, and homesteading, but one thing that seemed obvious to me, which relates to this post (and others), is how immersive this process needs to be in order to be done properly. Lots of talking, lots of listening, lots of exploring, lots of investigation by and between designer-clients-land-plants-habitats-animals-etc. In this context, I see a designer as someone whose job is to not only see through some kind of development with regard to some parcel of land but some kind of development regarding the people living on this land. To literally bring them to the point that they will takeover the the design process. That they become the designers. I think it might even be argued that this is their key purpose. The other part that seemed obvious to me is that everything C. Alexander proposes is adamantly opposed to how we do things currently. Well put Jeffrey and I couldn’t agree more with all you say here. When he presented his design process to us in 2103 (when we were hosting him for a series of courses in Australia) it fundamentally changed how we taught design. For the last three years (8 PDCs) Dave’s design process has formed the core of the Milkwood course. I’d like to see more permaculture teachers embrace it.